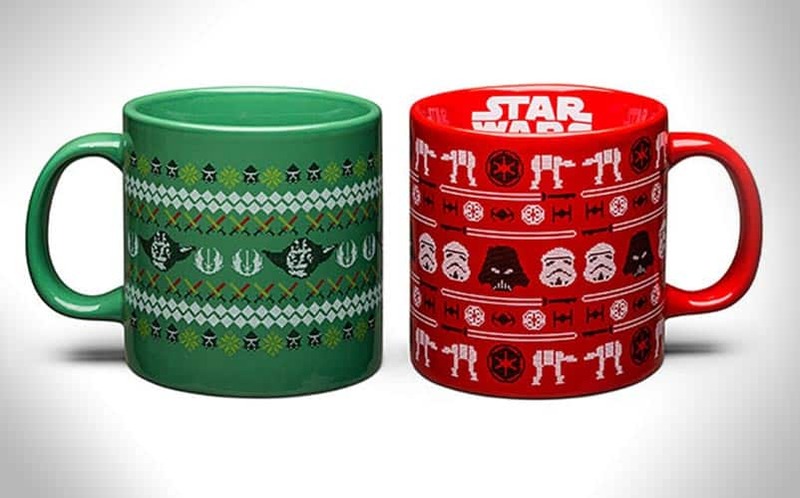 Star Wars Ugly Sweater Mugs | Nerd Much? It’s November 1st, and that means we can officially start talking about Christmas. Although to be honest, we’ve already been talking about Christmas for the past month. Every year, the holiday season brings us cool nerdy Christmas things, and this year isn’t any different. 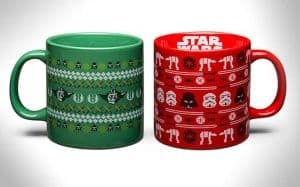 ThinkGeek has just unveiled their brand new Star Wars Ugly Sweater Mugs, and they’re exactly as magical as you’re imagining right now. There are two of these ugly sweater mugs currently available, a green mug with Yoda and Jedi Order symbols patterned, with green and red lightsabers dancing about above and below, as well as a red mug with Darth Vader and stormtroopers across the center, with a TIE Fighter pattern above and below and a Galactic Empire and AT-AT pattern on the top and bottom. The mugs have a 4″ diameter and hold 20 oz of your favorite holiday drink — for us, that means we’ll be drinking our eggnog coffees out of them. They’re the perfect blend of nerdy ugly Christmas sweaters and Star Wars. Buy the Star Wars Ugly Sweater Mugs here. For more cool nerdy Christmas stuff, stay tuned to Nerdmuch.com. You can also spread the holiday cheer by following us on Twitter.